If you were surprised by Lenovo’s budget Yoga notebooks at Mobile World Congress last year, then you must be in for another jolt this time around. The Chinese PC maker has added a bevy of new detachable and 2-in-1 Windows 10 PCs to its offerings at this year’s MWC, including the Miix 320, Yoga 720 and 520. The new Miix 320 is intended for consumers who are looking for powerful enough hardware to get their job done without breaking the bank. With a price tag of $199, Lenovo’s new detachable Miix 320 sports a 10.1-inch full HD display, up to 4GB of RAM, and up to 128GB of storage. Lenovo has also added some improvements to the detachable, including the addition of a precision trackpad. Over the past few years, Microsoft has been calling on laptop manufacturers to squeeze a precision trackpad into their products. Lenovo’s version is a bit surprising, though, given the low price point of the Miix 320. Intel’s Atom X5 still powers the device. Miix 320 supports LTE on certain models, which come in both white and silver versions. The device’s battery can provide up to 10 hours of juice to Miix 320. There’s also the Continuum support, which will automatically turn it to laptop or tablet mode seamlessly. Lenovo’s latest laptops continue to get inspiration from Microsoft’s Surface line. Two of those are laptops with a tablet mode and the third is a tablet with a laptop mode. The Yoga 720 and 520 can switch into several modes: tablet, laptop, stand, or tent. The Yoga 520 shows off 14-inch and 15-inch models. The latest 7th Gen Intel Core i7 processors power both variants, which can last up to 10 hours in FHD (1920×1080) resolution. You can also upgrade the graphics card to the Nvidia GeForce 940MX. Users can also opt to include a fingerprint reader to the 520 model, which is marketed as the Flex 5 in North America. The Yoga 720 boasts 13-inch and 15-inch models, both powered by the Intel Core i7 processors and juiced to last for up to 9 hours in FHD (1920×1080) resolution. The graphics card is upgradeable to the Nvidia GeForce GTX 1050. Unlike the 520, the 720 ships with a built-in fingerprint scanner. Both models include optional active pen support to let users edit, take notes, and sketch using Windows Ink. The Yoga 720 (13-inch) will be available on Lenovo’s website for $859.99 in April 2017. The Yoga 720 (15-inch) will go on sale on lenovo.com starting at $1,099.99 in April 2017. Meanwhile, the Flex 5 (14-inch) can be had for $799.99 in May 2017 on lenovo.com. 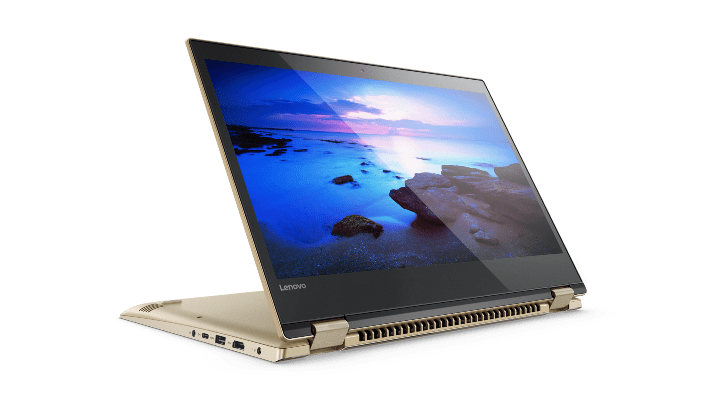 The Flex 5 (15-inch) will be available on lenovo.com for $799.99 in May 2017. The Miix 320 (keyboard included, Wi-Fi only without LTE) will be available to purchase on lenovo.com at $199.99 in April 2017. You can also buy the Miix 320 with Active Pen support and Microsoft Office 365 (for 12 months) beginning July 2017 on lenovo.com. The Yoga 720 (13-inch) will be available on lenovo.com for €999 in April 2017. The Yoga 720 (15-inch) will be available on lenovo.com for €1,099 in April 2017. You can also purchase the Yoga 520 (14-inch) on lenovo.com for €599 in July 2017. The Miix 320 (keyboard included, Wi-Fi only without LTE) will go on sale for €269 in April 2017 via Lenovo’s online store. Miix 320 (keyboard included, with LTE) will be available on lenovo.com for €399 in April 2017. You can also take advantage of local Telco contract for data even in overseas territories with the Lenovo Connect e-SIM, which now makes it easy for you to connect anywhere in the world without having to swap out SIM cards.